Hi everyone! 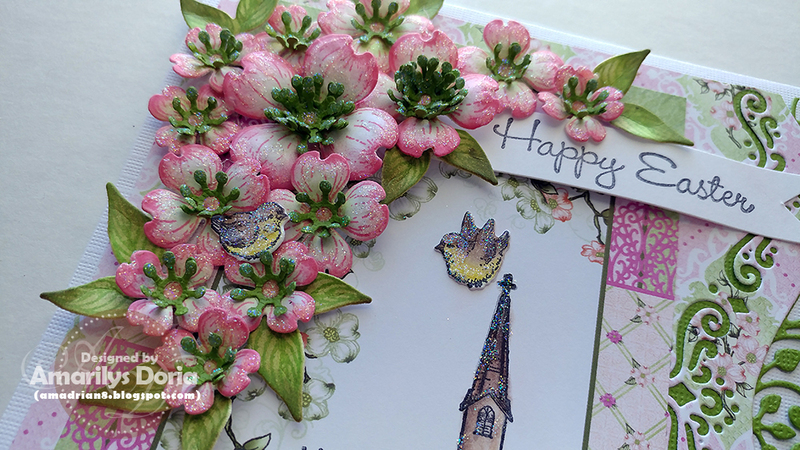 I have a card using the newest collection by Heartfelt Creations-Flowering Dogwood Collection with you today! Die cut a border on one of the sides of a 5.5"x5.5" pattern paper using the Delicate Border Basics Die and use a green die cut cardstock to mat it before adhering it to a 6"x6" white card base. Stamp and color the church from the Dogwood Chapel Cling Stamp Set on a pre-printed 4"x5.5" card base. Layer over the 6"x6" piece. Stamp different sizes of dogwood flowers on white cardstock. Die cut and ink the edges using the same ink you used to stamp them to give them some color. Shape and add a die cut green center. Stamp some leaves on white cardstock. Die cut and add color using the same green ink. Assemble your flowers and leaves and add to card as shown. Stamp the tiny birds from the Woodsy Critters Cling Stamp Set and color with Prismacolor Pencils. Die cut using their matching die and add to card. Stamp a sentiment on white cardstock and cut it into a pennant and add to card as shown. 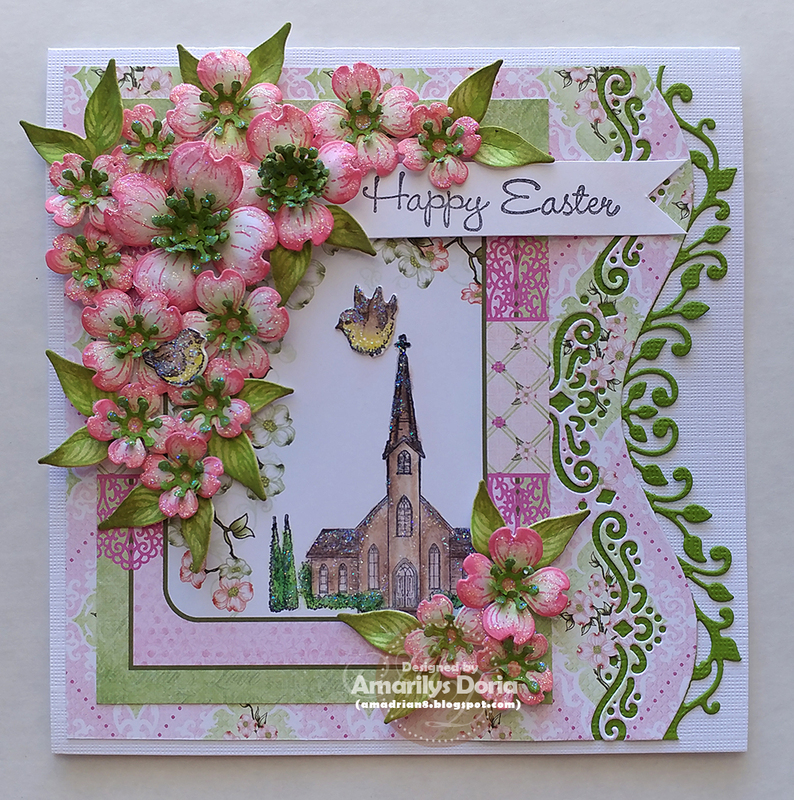 Finish by adding glitter to chapel, flowers and leaves, and birds. This is stunning my friend! 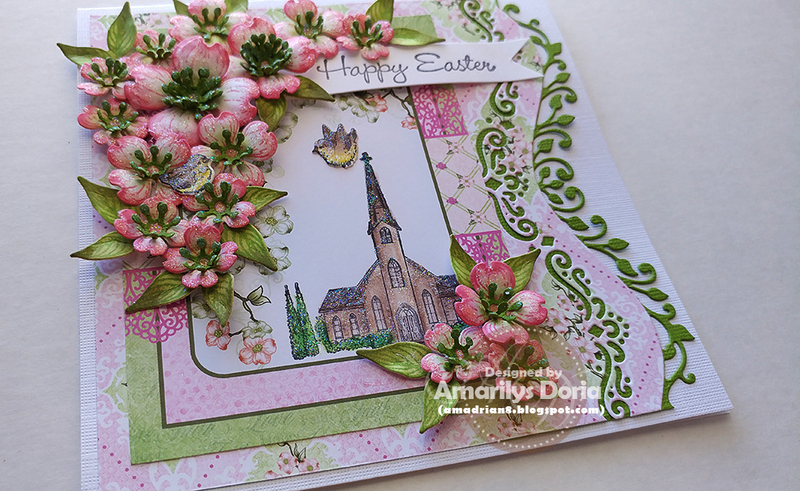 Amarilys, this is another outstandingly beautiful card. I guess I should leave more comments to let you know Im here but to tell you the truth I could never begin to do the beautiful work you do. I come to your site to sit and drool over your works of art. Your works are like a light at the end of the card tunnel. Thank you so much for sharing your abilities and talent with us.